With 17 hours of battery life in our tests, the Asus NovaGo could be a great laptop—if it solved all the other problems. 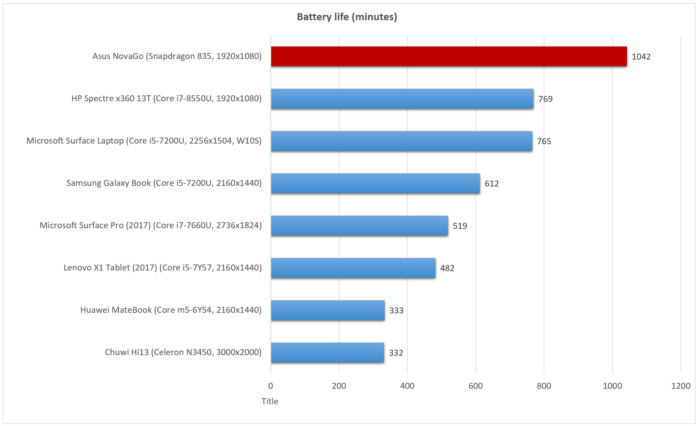 The Asus NovaGo delivers the best battery life of any PC we've ever seen. If you're always on the go, you should give serious consideration to what's being called "Always Connected PCs," a new breed of tablets and notebooks powered by a Qualcomm Snapdragon processor—yes, the same kind of processor found in many smartphones. ACPCs feature stunning battery life, nearly instant-on power, and constant connectivity in areas with a cellular connection. Rivals to the Asus NovaGo include the HP Envy x2 and the Lenovo Miix 630. These ACPCs are nearly identical to the Windows notebooks you know and love. The major difference other than the Qualcomm chip is the operating system: These devices will typically run Windows 10 S (which you can upgrade to Windows 10 Pro). But as our review revealed, there are other, more serious concerns about the laptop's performance, the limited number of apps that the processor and operating system allow, and the fact that you'll need to supply your own cellular SIM to enable this "connected" PC. Asus also told us that the unit we tested isn't the one you'll be able to buy in the United States. Instead, the company will ship a cut-down version of the NovaGo for American buyers, with 4GB of RAM and a 64GB SSD configuration, for $699 on Amazon. 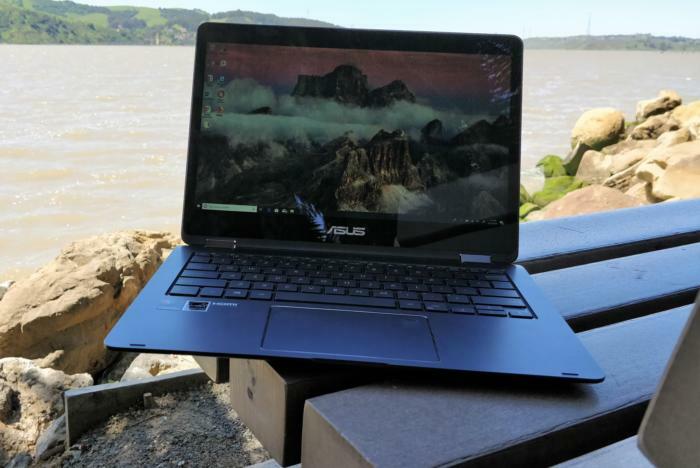 The Asus NovaGo absolutely delivers on its basic premise of a connected PC with all-day battery life. But as it currently stands, it's an enthusiast product—not one for gamers, but someone who enjoys testing beta software and apps. We'll walk you through all of the NovaGo's caveats, concerns, and questions, and you can decide whether it's suitable for you. Qualcomm, not AMD or Intel, is inside this laptop. Nothing about the NovaGo’s chassis signals anything unusual inside it. In fact, it’s a rather plain-looking convertible laptop, clad in “sky grey” plastic, with understated metallic accents. Only a “Qualcomm Snapdragon” sticker on the chassis, rather than the usual Intel or AMD badge, indicates something unusual. The Asus NovaGo we received included Windows 10 Pro, preconfigured by Qualcomm. Asus will ship the NovaGo with Windows 10 S installed, which limits the apps you can use to the Microsoft Store's. 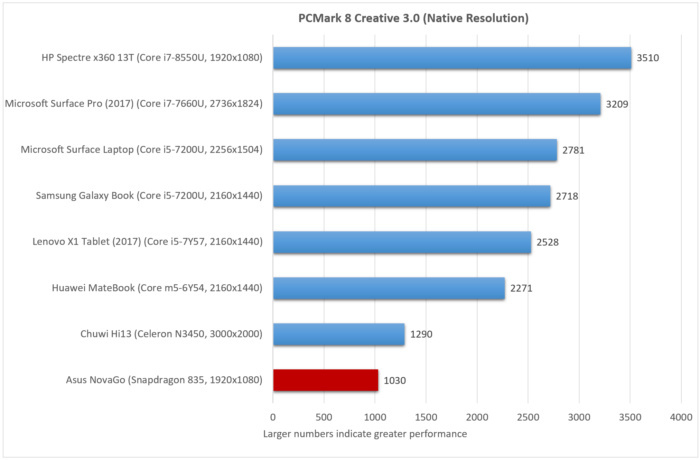 Windows 10 Pro allowed us a greater breadth of benchmarks, so we left it in place. As we experienced through our benchmarks, however, running non-Store apps takes a toll on performance. Part of the appeal of an Always Connected PC is its ability to work just about anywhere, and the laptop’s form factor delivers. The NovaGo is built simply but sturdily, with a pair of metal 360-degree hinges that allow the laptop to fully rotate into tablet mode. I didn’t notice any flex in the keyboard, and the NovaGo’s stiff hinge accommodated bounces and wobbles while I was using it on the subway. While the screen can be read outdoors, it’s really only usable (and then only partly so) when in the shade. The screen is also, unfortunately, the primary disappointment when it comes to on-the-go computing. Its 100-percent sRGB support provides pleasing color fidelity, but its maximum luminosity of 278 nits left it mostly unreadable under bright sunlight, unless you were viewing a high-contrast workspace (like a white webpage or Word document). This isn’t a PC you can use to “work” by the pool. Omitting conveniences like number- and function-key locks is a forgivable offense, but the Asus NovaGo also entirely skipped assigning any functions to the F3 and F4 keys. That’s a waste of space. The typing experience is relatively mediocre as well, as we’ve unfortunately noticed with other Asus keyboards. Though the NovaGo’s keys are broad enough to provide a comfortable landing surface, they’re too shallow (with just 1.4mm key travel) for long periods of typing. There’s also no backlight. Another risk of mobile form factors is the shrinkage or loss of keys you might have cared about. We don't mind that the NovaGo omits number lock and function lock keys. However, we're puzzled about the lack of function assignment to the F3 and F4 keys. That seems like a wasted opportunity. The NovaGo’s trackpad is better. It extends a sizeable 4.5 inches across and 2.75 inches down, a nice, large space for swiping without dominating too much of the palm rest. A large trackpad and small fingerprint sensor dominate the lower half of the keyboard. 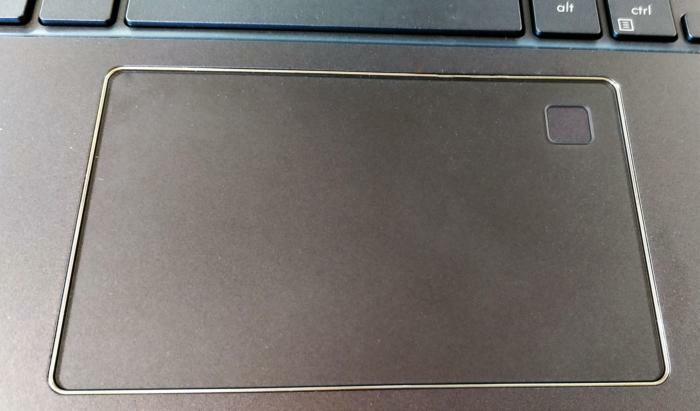 Asus also mounted a small fingerprint sensor within the trackpad’s upper-right-hand corner. It’s compatible with Windows Hello (while the NovaGo’s front-facing camera is not). The NovaGo’s sensor sometimes didn’t recognize my finger, but adjusting my finger and retrying took just a second or two. The promise of the Always Connected PC is twofold: instant access to data, along with the battery life to enjoy it. The NovaGo fulfills both promises, at least in metro areas. 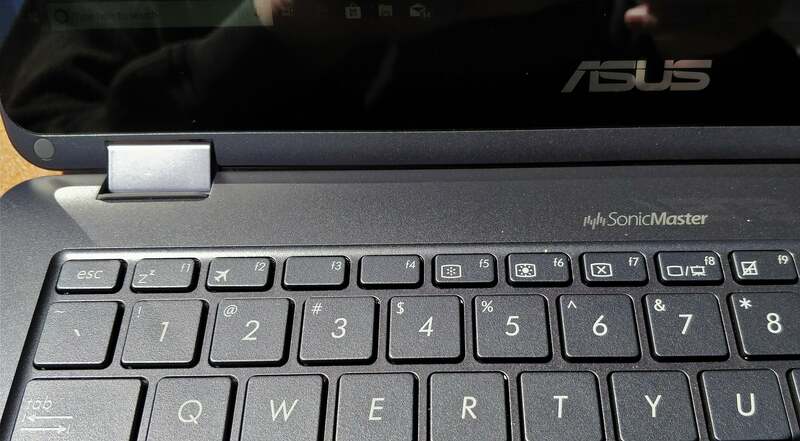 On the right-hand-side of the Asus NovaGo are the power switch, the volume rocker, the headphone/mic jack, the HDMI slot, and the SIM/SD card slot. Ironically, the T-Mobile SIM provided with the review unit didn't help. I live right at the periphery of two T-Mobile cell towers, and the network tends to become congested on our crowded commuter trains. Because Qualcomm’s radios support all four U.S. networks, I was able to swap in a Verizon SIM card with little fuss, and my connectivity and data throughput somewhat improved. Cellular signal coverage always varies by area, so I sampled several sites with the Verizon SIM. Throughput varied wildly, even in the same location, from a low of 9.75Mbps down and 5.94Mbps up, to highs of 118.97Mbps down and 8.31Mbps up. In each case, I successfully streamed a 1080p video with no hiccups. Between Wi-Fi and cellular service, the Asus NovaGo lived up to its promise of constant connectivity, T-Mobile’s issues with BART excluded. But the NovaGo does not ship with even a trial cellular subscription, so you’ll be forced to buy your own cellular SIM and pay for the accompanying data plan. That’s a significant additional cost, perhaps $10 or so per month, even if you opt for a pay-as-you-go plan. There’s another option, of course: Forgo the SIM and simply tether the NovaGo like any other PC. That strips away one big chunk of the Asus NovaGo’s appeal, however. 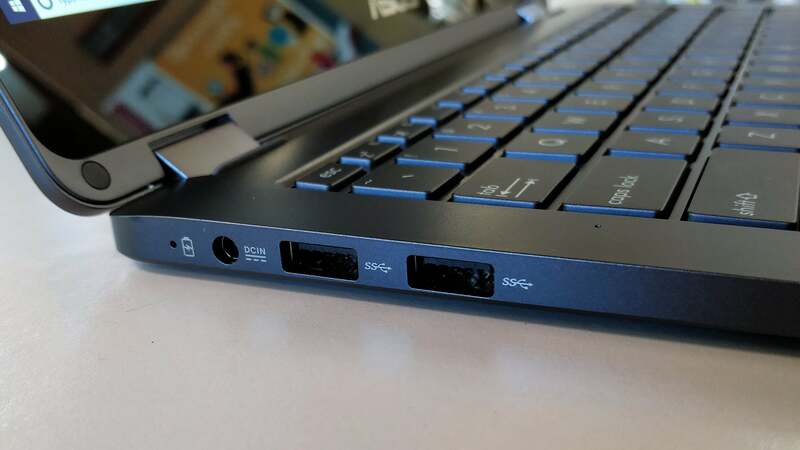 Asus chose USB-A connectors over USB-C. The marquee feature of the Asus NovaGo and the Qualcomm Snapdragon chip powering it is battery life, and this laptop delivers. Put simply, we’ve never seen anything like it. Whether it’s surfing the web or working remotely, the Snapdragon and the associated 38.5Wh battery literally allow you to roll out of bed, open the lid, and work until bedtime. It’s an entirely new selling point for a Windows PC, deserving of a standing ovation. We did run into a bug while testing battery life, during which we loop a video until the battery expires. Our standard 4K video test file apparently broke the Windows 10 Movies & TV app, or at least the version written for the Snapdragon. A similar open-source 4K file wouldn’t play back, either. (As we normally do, we set the display brightness to a comfortable 250-nit setting—brighter than most manufacturers do, it should be noted.) I stepped down to a lower-resolution HD file, and the app played it normally. The performance speaks for itself: 1,042 minutes, or 17 hours and 22 minutes. That’s more than 25 percent longer than the previous recordholder, the Dell XPS 13 9360, which lasted 828 minutes (using an Intel Broadwell chip). It pushes the NovaGo's endurance into smartphone and tablet territory—not surprising, of course, given the chip inside of it. Without a doubt, battery life is what will sell the Asus NovaGo. Qualcomm made the case that experiencing the Asus NovaGo and its Snapdragon processor in the real world, over a period of time, was the best way to assess its worth. 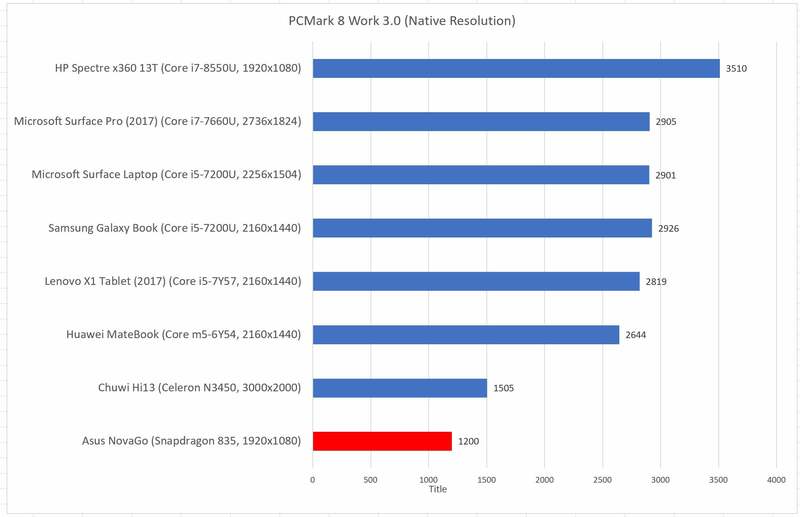 But we know many Windows PC users will be looking at the NovaGo and other Always Connected PCs, so we also ran some established benchmarks. The NovaGo boasts 8GB of memory and an SSD, which should produce a fairly smooth experience. If it doesn’t, something—the OS, processor, cellular radio, or some combination of all three—is at fault. Using the Asus NovaGo for basic tasks often feels slow. At one point, I had five tabs open in Chrome and three open in Edge, with a YouTube livestream on one of the Edge tabs. (Remember, our unit shipped with Windows 10 Pro; on Windows 10 S, Chrome can't be installed.) Navigating within the stream felt very slow, with a second or two required to trigger a response. There was also noticeable lag when typing into a text field within Twitter. Sometimes, surfing the web on my commute felt fast. But on other occasions, I’d have to tap and retap just to orient the cursor on the URL field, especially when the NovaGo was folded back into tablet mode. As a desk-bound laptop at home, however, it performed competently. Other methods to evaluate a laptop's responsiveness include cold boot times, resumption from sleep, app installs, app loads, decompressing files, and so on. We tried a few, first by installing Adobe's Acrobat Reader (excluding the download time) on an old Core m-powered Huawei Matebook from 2016, one of the slower tablets in our inventory. The NovaGo took more than twice as long—98 seconds, versus 46.25 seconds on the Matebook. You instinctively know how long a PC should probably take to boot, resume from sleep, and load a webpage—you do it every day. In my experience, the NovaGo is slow to “cold” boot: slightly under 30 seconds, as opposed to about 17 seconds for several of our other tablets or notebooks. Resuming activity after the lid is closed, though, is competitive: about two seconds or so. And the screen lights virtually instantaneously. Even with the simplest tests of web browsing, though, you bump up against one of the NovaGo’s obstacles. Microsoft has always tacitly encouraged you to use Edge. Because Edge is part of the Windows 10 OS, it runs natively. The rival Google Chrome browser, which is vastly preferred by users, runs in an emulated mode. As a result, Edge starts up faster and feels smoother than Chrome, especially—and this is really counterintuitive—if you have ad-blocking turned on in Chrome. To test it, I loaded PCWorld’s homepage on a clean version of Edge, rebooting and reloading three times. (I measured the time it took to load a “responsive” page, meaning a page with content that could be scrolled.) I then did the same with Chrome, with two anti-ad and -script technologies turned on: AdBlock and Ghostery. I then disabled them and went through the process again. The kicker? I’m pretty sure it’s because ad blockers are emulated, slowing the overall browsing experience. So whether the NovaGo is running Windows 10 S or Windows 10 Pro, my experience led me to believe that Microsoft Edge should deliver the best real-world browsing. 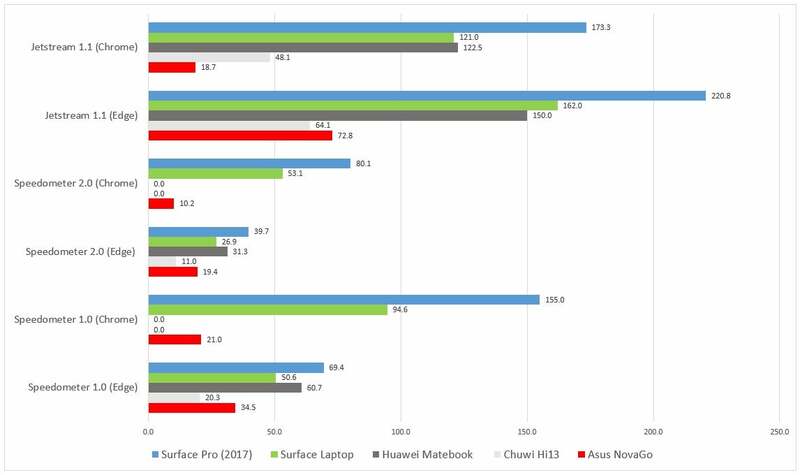 I tested that assumption by running several browser-based tests on the Asus NovaGo, comparing web performance to some traditional PCs, including a Core m-powered Huawei Matebook and a Celeron-driven Chuwi Hi13, as well as the more recent Surface Laptop and Surface Pro (2017). The benchmarks indicate several things: First, as you might expect, Edge delivers superior performance over the emulated Chrome browser on the NovaGo. But the tests also seemed to confirm my own experiences while using Edge: With some tests, Edge on the NovaGo generated scores that were within shouting distance of what I would consider a good, solid laptop, the Microsoft Surface Laptop. In other situations, they lagged far behind. With the NovaGo, web browsing—among the most common PC tasks—is a mixed bag. Our usual suite of benchmarks for Windows PCs posed several challenges for the NovaGo. Anything that used a 64-bit executable was a non-starter, including Cinebench. (Microsoft released a 64-bit SDK at its recent Build conference that will allow 64-bit apps, though we didn't have access to it.) 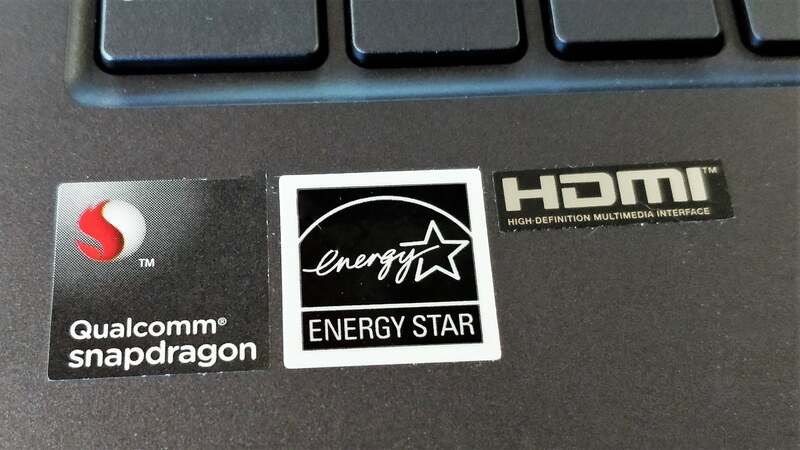 Both of the PCMark Home and Creative tests ran, though the Home test failed to complete an early run when we first received the laptop. And while we weren't able to generate a PCMark Worlk test when our review ran, a later build managed to generate a score. Evidence of the ongoing bug fixes? Perhaps. Remember, too, that all of these tests used emulated apps, which will depress performance quite a bit. Both the Home and Creative tests from PCMark demonstrate how well the Snapdragon-powered system completes basic tasks like web browsing, light “gaming,” and video calls. The Creative test adds some image and video manipulation. While Qualcomm has been adamant that standardized testing is not an appropriate measurement of performance, the tests confirmed what we already knew: Right now, a Qualcomm Snapdragon PC is really slow. Here's the new PCMark Work score, too. No surprises here. Another standardized app we use is HandBrake, an open-source tool we use to convert a movie file for use on an Android tablet. It's a good CPU stress test. 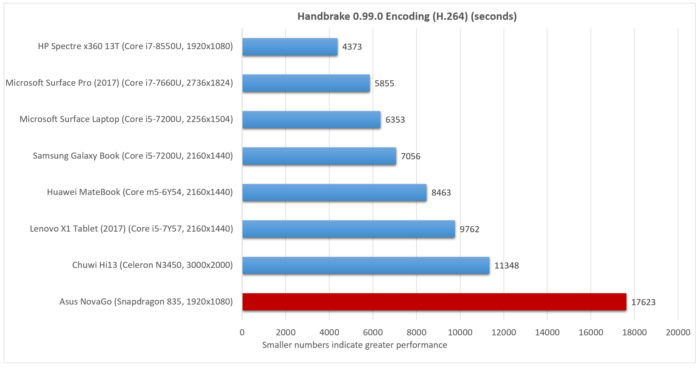 Handbrake’s transcoding took forever to run on the Asus NovaGo—not exactly what you want to happen when you’re converting a movie in time to catch a plane. The results were bad: possibly the worst we’ve seen in a long time: 17,623 seconds, or 293.7 minutes, or almost five hours to transcode the movie. That’s slower than the Atom X7-8700 in the 2015 Microsoft Surface 3, the Core m parts that populate some PCs like the HP Folio 1020, or the Celeron N3450 in the Chuwi Hi13. 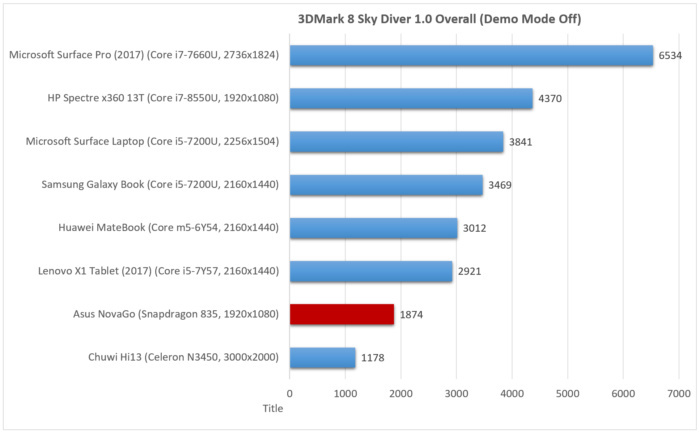 Somewhat ironically, the 3DMark Sky Diver test was able to run, measuring how the integrated Qualcomm Adreno 540 GPU would fare in 3D gaming. Given the fact that the Chuwi Hi13 was able to run light games like DOTA2 and League of Legends, we’d expect that the NovaGo could do the same. Asphalt 8, one of the more demanding mobile games available, also ran perfectly acceptably. Only a Chuwi laptop powered by an Atom chip performed worse than the Asus NovaGo. If the Asus NovaGo intrigues you, despite all its caveats and inconveniences, then I can very hesitantly recommend it. 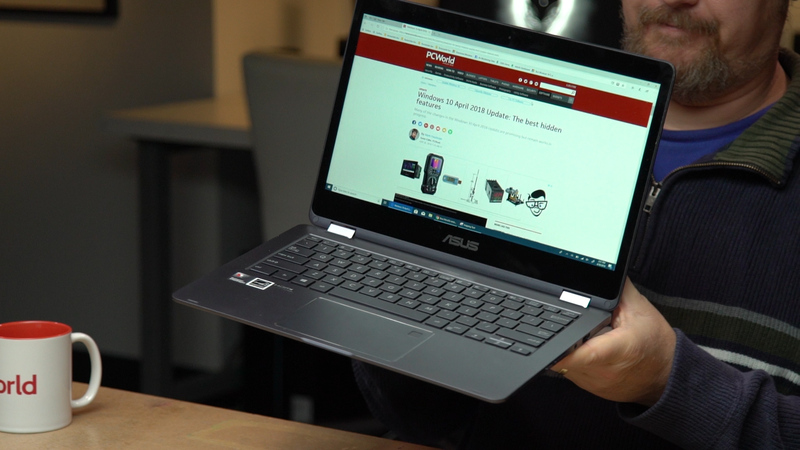 Asus and Qualcomm certainly satisfy the basic premise of an all-day, always-connected PC, a necessary evolutionary step for the platform. But when one of the vendors involved with the product recommends that you join the Windows Insider beta program to apply bug fixes as they’re implemented, this is a problem. We do know that the NovaGo experience will improve. As developers write and release versions for ARM chips, those higher-performing native apps will be delivered automatically via the Windows Store. Microsoft hopes, too, that other apps will eventually be delivered as what it calls Progressive Web Apps: a mobile webpage, packaged as an app, which will help fill the gap. 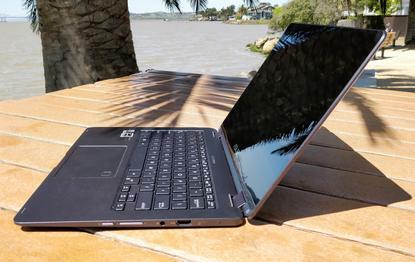 Nevertheless, the Asus NovaGo is a version 1.0 product competing against generations of established rivals. Only the most committed buyers should buy the NovaGo over a more traditional notebook. 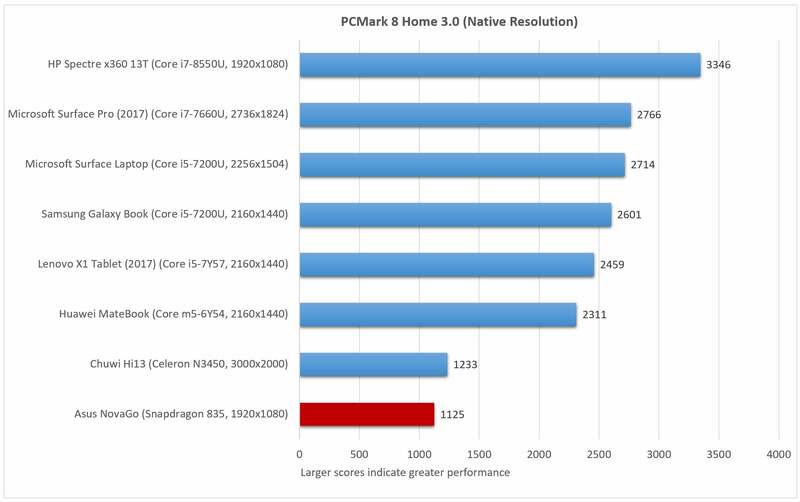 This review was updated on August 6 with an additional PCMark Work score.